Right now, World Concern’s Sri Lanka staff is helping many civilians injured during recent attacks. World Concern is one of only a few humanitarian relief agencies permitted by the government to help. We’re providing food, bedding, clothing and personal supplies to both the wounded and the weary aid workers. It appears to be the last deadly throes of a long civil war. The ethnic minority that has been fighting for autonomy has been cornered. Regardless of your perspective, innocent families are paying with the lives of their loved ones because of this war. 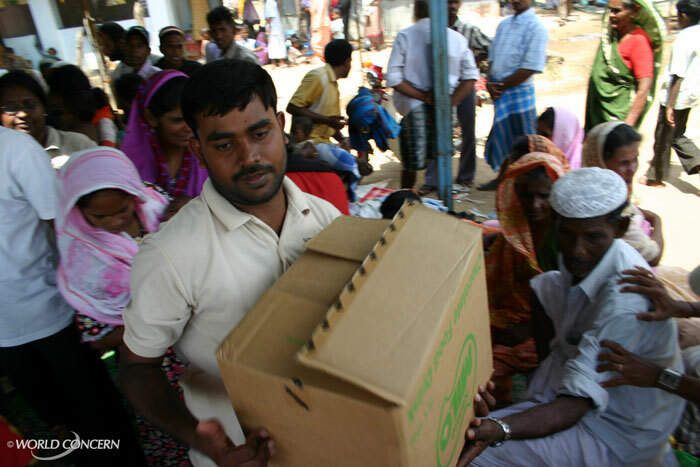 World Concern provides essential supplies and food for people injured during the Sri Lanka civil war. You can read more about what we’re doing and donate to help. We need money for our response! Sri Lanka’s three decade old conflict between the LTTE (Tamil Tigers) and the Sri Lankan Government is at its fiercest. 70,000 have already lost their lives in a separatist struggle for control of ‘Eelam’, a self-designated homeland for Tamils by the LTTE. Having lost control of the East of the island in 2007 the LTTE now faces a fight for survival in an ever decreasing space in the North. The safety of an estimated quarter of a million civilians trapped within this conflict zone is of grave concern to humanitarian organizations. These Tamil families have been on the move now for months, continually retreating as air strikes, artillery fire and ground battles rage around them on three boarders to the North, West and South. Their retreat to the North Eastern corner of the Island has them pressed hard up against the Eastern coast with nowhere further to run. Continual pleas by humanitarian agencies have resulted in the establishment of ‘safe zones’ within the war zone, but civilians face real danger trying to get into these zones, or indeed trying to flee the North for the Government controlled areas in the South of the Island. The LTTE have blocked their movement holding the population back for political legitimacy and as a recruitment pool as they lose fighters on the front lines. Meanwhile the constricted fighting space is resulting in mounting civilian casualties. On 3rd February a crowded hospital was shelled three times killing 52 civilians and injuring many more according to ICRC (International Committee of the Red Cross). Both sides deny shelling the hospital. Sadly these tragedies are becoming all too frequent. With a ground victory appearing imminent and geo-political conditions favoring the Sri Lankan government – India broadly support the defeat of the LTTE with Sonia Gandhi having lost her husband to an LTTE suicide bomber; the US under the Bush Administration offered technical support to the Sri Lankan security forces and was the first to proscribe the LTTE as a terrorist organization – the Government are eager to eliminate the LTTE. However this war is costly both in economic terms at $1.6 billion annually and in lives with scores of government solders dying daily (an independent body count organization, the Foundation for Coexistence, puts the collective death toll in the north at 3,200 for December and January alone). More than 70,000 people have died during Sri Lanka's civil war. World Concern is helping with food and essential supplies for the wounded. In order to maintain political support for the war the Government has suppressed its own casualty numbers and is eager to control the message both within Sri Lanka and abroad. Maintaining staunch nationalist support for the military has meant a steady erosion of free speech, credible reporting, and the suppression of discussion of any other solution to this conflict other than the current military one. Dozens of reporters have been killed in the last year, including a bold assassination of a senior editor in broad daylight on 8th January. Sri Lanka ranks 141 out of 165 countries for press freedom by Reporters without Borders (http://www.rsf.org) having slipped from 51st place in 2002. To put that in perspective Sri Lanka now ranks just beneath Zimbabwe and Sudan and just above the Democratic Republic of Congo and Somalia. This is making the work of Humanitarian agencies all the harder as it seeks a non-violent solution for those trapped by the fighting. It is now simply a matter of time before civilians either flee en masse – around 100 a day are managing to escape now – or face a bloody battle in much closer quarters as the Government try to eliminate the remaining LTTE from their midst.